EMD (Electro-Motive Diesel), now recognized under the Progress Rail and Caterpillar names, is a leading manufacturer specializing in diesel-electric locomotives for various commercial railroad needs. EMD offers close to 100 years of experience in its field and is well known for providing high quality and reliable locomotives. EquipNet is constantly receiving used EMD equipment through our exclusive contracts with our clients. 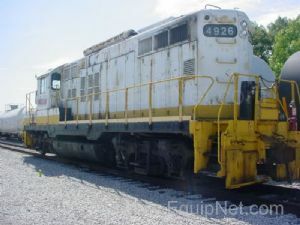 Our inventory of used EMD equipment includes rail cars and more. We are constantly receiving used EMD equipment in various models and styles. If you don't see the used EMD equipment you are looking for, call one of our representatives and we will find it for you. We can also source the right tooling and change parts that you need through our huge network of corporate clients around the globe.